Earlier this year, JR East announced that they would be retiring the MAX Series Shinkansen, which currently serves the Joetsu, Tohoku, and Nagano Shinkansen lines. The phase-out is slated to begin in July 2012, with a complete withdraw by 2016. The E1 and E4 Series Shinkansen are 8 to 16-car double-decker trains. Between the E4 and it’s double-deckered cousin, the slightly older E1, they run under the service name MAX, which stands for Multi-Amenity eXpress. Despite the name, it doesn’t provide any additional services outside of other Shinkansen running throughout Japan, but it does have the capacity to hold a lot of people. For example, a 16-car E4 train has seats for 1,634 passengers, which currently holds the record for the highest-capacity high-speed rail trainset in the world, and has held that title ever since the train went into service in 1997. In comparison, the E1 is a 12-car trainset which has a seat capacity of 1,235 and entered service in 1994. 12-car E1 Series - Fun Fact: You could fit the population of Vatican City into this one train. There's even enough room for the Pope to have his own car. Soon after it’s upcoming retirement was announced, I was curious to why the MAX Series was slated to go into retirement in the first place. At first sight, the E1 and E4 don’t appear to be that aged nor worn out…and that’s because they’re not. Both have been in service for no more than 17 years, and when you look at the E4, it still has a very modern design to it. It’s a look that has been inherited by the newer E5 and E6 Shinkansen Series and will probably used for future trains beyond those. And when you compare the age of the E1/E4 with the 0 Series Shinkansen, the granddaddy of them all which was in service for 44 years, they’re still babies. The E1 and E4 both have a maximum speed of 240 km/h (150mph). The E5 current runs along the Tohoku Shinkansen line at 300 km/h (186mph) and is slated to run at 320 km/h (200mph) from 2013. Because of their size, the E1 and E4 simply don’t have the ability to operate at that speed. ‘’But wouldn’t replacing a double-decker train with a single-leveled train reduce the overall number of seats available?” I thought to myself. However, replacing the MAX Series with faster trains would allow additional trains to enter the timetable, offsetting the reduction in seats. Since JR East hasn’t released a formal press release as to why they’re going to retire these trains, the above reasons are purely speculations that I’ve gathered from a number of sites. However, in my personal opinion, there is a third reason that should be looked at. 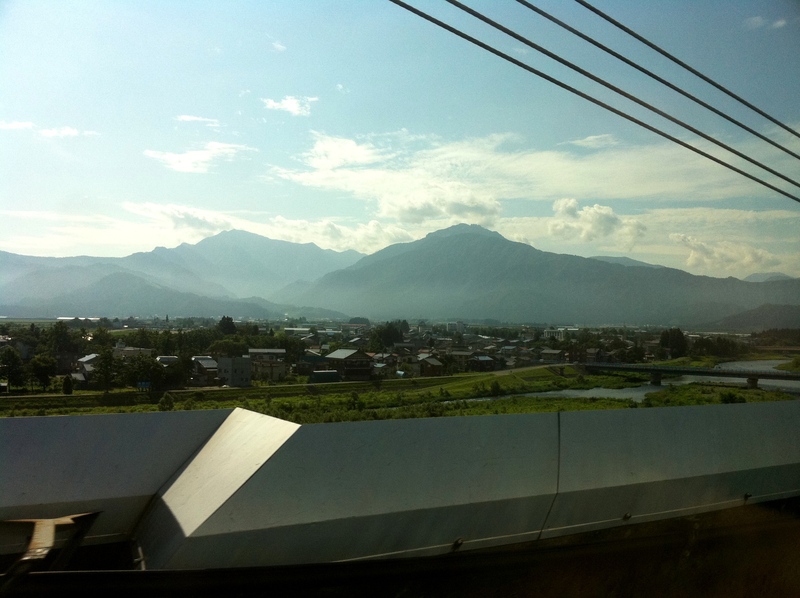 Because the double-decker trains sit slightly higher than single-level trains, it allows great views of the scenery along the way…IF you sit in the upper deck. When sitting in the lower deck, you either have a view of people’s feet, a wall, or nothing at all because someone decided to pull the shade down over the window due to the lack of scenery in the first place. I think for those reasons, the lower deck is usually the preferred seat for most businessmen using the Shinkansen for commuting to and from work because it’s not as crowded as the upper deck, and they don’t give a hoot about what’s out the window since they’re usually focused on their canned coffee (or canned beer if leaving work) and Mainichi newspaper. Also, the seat configuration is different depending on which deck you sit in. The seats in the lower deck have a 2+3 (2 on one side, 3 on the other) configuration and all seats have the ability to recline. The seats in the upper deck are in a 3+3 configuration and none of them recline. This inconsistency in seating arrangement can be confusing to some, and in some cases, cause some decks to be completely empty while the other one is full. Perhaps another reason to retire the bi-leveled trains is to simply create consistency in one train since it better accommodates passengers, and also reduces the difficulty of having to design different arrangements for different parts of the train. What will they be replaced with? Nothing has been formally announced yet, but early signs point to them being replaced with the E5 Series. On September 15th, the E5 was spotted at Echigo-Yuzawa Station in Niigata Prefecture during a test run. It was the first time the E5 was seen running along the Joetsu Shinkansen line. i see what you're up to. Since then, the E5 has been spotted on various days throughout the area. 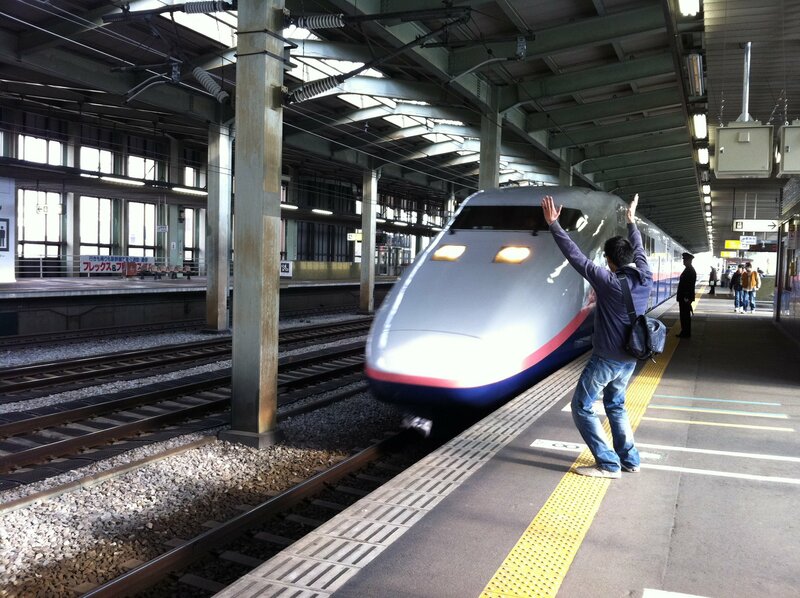 Could this be the future of the Joetsu Shinkansen line? No one is expecting an E7 Series anytime soon, so this could become the norm for not only the Joetsu Line, but also the soon-to-be-extended Hokuriku Shinkansen Line (currently called the Nagano Shinkansen Line) to Toyama, which is slated to open from 2014. Although I am excited at the possibility of riding new trains around where I live, I’ll miss the MAX Series, the E4 in particular. you think this distracts the driver? The E4 was one of the very first high-speed rail trains I’ve ever ridden after coming to Japan, and it was the train I always relied on to take me back and forth to Tokyo. From my old apartment, I was able to see the shinkansen track from my balcony and there were countless times where I’d wait there to see the massive machines speed by. I guess I could say that the E4 is partially to blame for my deep fascination (obsession, maybe?) with trains. 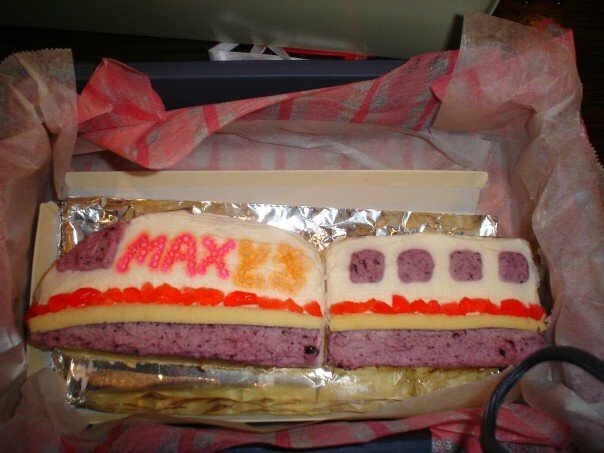 Heck, even my birthday cake a few years back was a MAX! However, the opening of new lines and the operation of new trains mean that there will be new places to explore. With all the new development within the railway industry that is happening throughout the country, it only leads me to believe that my train journeys in Japan is just getting started. Some of them are mine, others are gathered around the web. The ones which ARE NOT mine, have been hyperlinked and will direct you to the source from which they are from. Although a majority of them are from Japanese blogs and other sites, they’re still worth looking at as some of the pictures are down-right gorgeous, whether you’re into trains or not. Just thought you should know.